15 days at Indianapolis Motor Speedway has been led to the most iconic honour of American auto racing, the 2010 Indianapolis 500. Extending the memories of the 94th running Indy 500, The pre-race festivities provided noontime ambiance building up historic main event. As the final soldier marched off the speedway surface, the U.S. National Anthem was sung, and the driver introductions have been made, 33 engines awoke on command each car within the hands of open wheel's biggest stars. Leading the field with the 2010 Chevrolet Camaro SS pace car, ABC Good Morning America personality Robin Roberts brought the Dallara-Hondas to green with Helio Castroneves leading the 33 IZOD IndyCar drivers. Breaking out of the three-wide car formation even before the pace car returned to pit lane, the start of the 2010 Indy 500 was initiated by actor Jack Nickolson. Jumping out from his 3rd place spot, Target/Chip Ganassi Racing's #10 of Dario Franchitti jumped the front row running Penske Racing cars of Helio Castroneves and Will Power to take the lead out of turn 1. The initial green flag run would not last long as two cautions slowed the Indy 500 early. 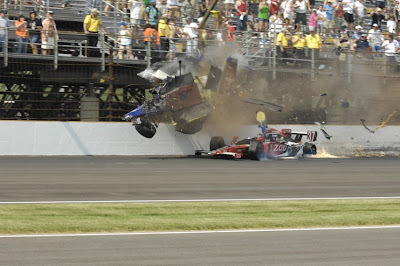 Davey Hamilton's one-off Indy 500 appearance ended on the first lap after a spin out of turn two. Cutting left to avoid another vehicle, Hamilton's #21 car slid into the inner SAFER wall. With a restart on lap 5, only 2 laps would be run before another single car crash involving the #33 car of Bruno Junqueira ended a hard-earned effort. After missing out on the 2009 event due to a post-qualifying injury that resulted in Tagliani's ride in the Indy 500, the FAZZT Race Team looked forward to fielding Junqueira. However, throughout the preparations for the Indy 500, sponsorship woes hurt their effort resulting in limited track time. Thankfully, company Service Central migrated to the #33 car after the Sarah Fisher Racing effort driven by Jay Howard failed to make the 2010 Indy field. Obviously, with all the hard work simply by getting into the race, Bruno Junqueira's 32nd place finish in the 2010 Indy 500 would not do justice to those efforts. After the first cautions, a green flag run was finally established within the field. On lap 31, Penske Racing's #12 car of Will Power was actually able to pass Dario Franchitti (a feat to be considered more impressive at the end of the day). Franchitti was able to retake the lead 5 laps later. Team Penske remained intact with the leading Target car throughout the event but the Scotman's charge this race would indeed be impressive. Another strong car early in the event was Tony Kanaan driving the #11 Andretti Autosport car. Starting 33rd in a car with parts borrowed from teammate Ryan Hunter-Reay's #37 IZOD car, Kanaan shot front immediately on the start getting back half the field before the first round of green flag pit stops. By lap 35, pit stops were first performed as IZOD IndyCar competitors desperately require fuel and tires. For 10-time Indy 500 winning Penske Racing, the 2010 event has been a bizarre experience for all three of Roger Penske's cars. In regards to the #3 of Helio Castroneves and Will Power's #12, pit stops made the typically razor sharp Penske pit work look rather clumsy. With no fewer than 3 pit road mistakes, the most extreme error occurred during Will Power's first pit stop through the Indy 500 where the Australian stormed out of the pit with a piece of refueling equipment still attached to his vehicle. As part of the pit equipment littered itself onto the race track, officials called the third yellow flag, Will Power saved himself the trip for pit lane under green but needed to pit both to remove the refueling hose and to serve an additional penalty for the miscue (a driver-through penalty required at the time when the field went green on lap 43. Continuing with a plague of single-car wrecks after the lap 43 restart, John Andretti lost his #43 Window World car in turn 2 on lap 65. Offering an opportunity for teams to make pit stops under caution, many of the leaders steered for fuel/tire service. Through pit stops, two instances of unsecured wheels presented themselves of Scott Dixon's #9 lost a left-front while the #2 of Raphael Matos lost a left-rear in the congested pit road. While Dixon would continue through to the end of the race, Matos' day ended 5 laps after the loose wheel incident with his blue #2 car crashed in turn 1 alone. Just past the halfway mark, Vitor Meira would be the next to suffer a retirement due to contact with the Indianapolis Motor Speedway's SAFER barrier. Fortunately for Meira, who missed 5 months of the 2009 IndyCar season due to an Indy 500 wreck, he escaped unhurt from the badly-damaged #14 car owned by A.J. Foyt. Showing dominant form at the front, the #10 Target/Chip Ganassi Racing car led for 70 consecutive laps from prior to lap 39 through the Indy 500's halfway point. Relinquishing the lead briefly to Tomas Scheckter, Franchitti would reassume the lead on lap 114 for another 29 laps. Within this green flag run, the #10 car was able to gain a 6.25 second lead at one point over than second-place Tony Kanaan. Entering the 3/4 stage of the 2010 Indy 500, the pace would be slowed two more times. On lap 148, Penske Racing's Ryan Briscoe, who was the only driver inside the three-car team who would enjoy flawless pit service through the Indy 500 of 2010, meet the wall after running wide through turn 4. 13 laps following that incident, Sebastian Saavedra crashed hard between turn 1 and 2 after his car's rear smacked into the outside wall. As pit stops were undertaken under this caution, it because apparent to most teams that they're stretching fuel mileage. Having lost the multiple-setting fuel mixture controls IZOD IndyCar teams had last season, cars able to make it the distance would need a driver with a light accelerator foot and mindful use of the gear shift lever. Once the lap 166 green restart approached, four teams dared a wager that there would be at least one more caution within about 20 laps. The #24 Dad's Root Beer car of Mike Conway, #22 Z-Line Design car of Justin Wilson, #3 Verizon Penske vehicle of Helio Castroneves and the #30 car of Graham Rahal stayed on the track while other teams made pit stops to be only marginally close of making it lap 200. With Mike Conway out front leading his first ever IZOD IndyCar Series laps, the quartet were able to hold onto their spots until the first of them conceded to their falling fuel measurements. As many of the drivers pitted, the lead returned to Dario Franchitti risking the likeihood that his #10 Target/Chip Ganassi Racing car had enough fuel. Into the final two laps, only him and the #4 Panther Racing National Guard car by Dan Wheldon were gambling to make the full distance. 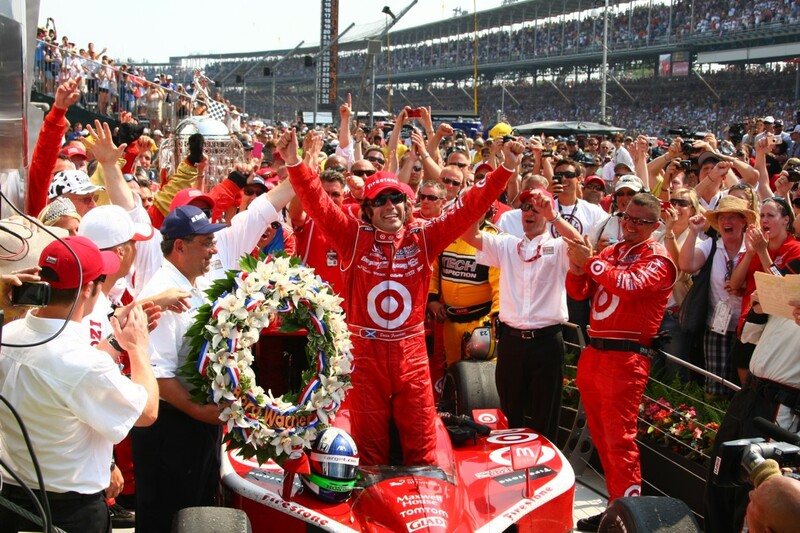 Dropping down to laps just above 200 miles per hour average, Franchitti was keeping Wheldon at bay but there was a nervous feeling amongst the Target/Chip Ganassi Racing crew into the final lap. On that final lap of the 2010 Indy 500, a major crash resulted behind the leaders involving the #24 car of Mike Conway and the #37 of Ryan Hunter-Reay. Through the stretch between turn 3 and 4, the #24 car drove up into the #37 in a fashion which caught the IZOD car's front tire. This tire seemingly launched Conway's car into the air over Hunter-Reay. Proceeding to crash into the catch fence, Conway's #24 car was sheared at its engine mounts as dozens of large pieces of debris flew from the deteriorating Indy car. After spending several seconds airborne, the cockpit section holding Conway finally landed although frighteningly upside-down. Once safety crew arrived, they confirmed that driver Mike Conway was awake and alert. In the infield medical center, it was determined Conway suffered an injury to his left leg and was airlifted to Methodist Hospital in Indianapolis. Ryan Humter-Reay also reported to have received an injury to his thumb but was released after being evaluated by a physician. Besides the concerns for driver injury, the spray of broken parts regrettably caused reflections on spectators. Reportedly, two suffered minor injuries due to flying debris. One required stitches to their forehead. Ultimately, with the field under yellow, Dario Franchitti was able to make a slow final lap to win his second-ever Indy 500 in 2010. With the #10 Target pit crew, team owner Chip Ganassi and Dario's wife Ashley Judd celebrating with the Scottish driver in victory lane, this 2010 victory comes after going the full race distance (in 2007, the race went to 166 laps before it was called for rain). After tasting the traditional milk in victory lane, Dario offered a post-race account of the final laps. "I was just thinking. This tastes just as good second time. Up until 10 laps to go, I was pretty relaxed. Then all hell broke loose with fuel savings and all. I just needed to know what the other guys were doing. If they were saving more than me, they were doing something special here. This means so much. To come back after going away for a year, win a championship and win the Indy 500. Thank you. Thank you to everyone on Team Target." As for Chip Ganassi, he celebrated with his IndyCar team and even joined Dario for a parade lap around on the back of a Chevrolet Corvette before departing for Charlotte to oversee his NASCAR Sprint Cup team in the Coca-Cola 600. Settling for 2nd for the 2nd consecutive Indy 500, Dan Wheldon again placed his #4 Panther Racing team against the best IZOD IndyCar superteams. Marco Andretti, originally scored 6th at the end, was moved the 3rd after the IRL reviewed that the #26 Andretti Autosport was passed under the final caution. rounding out the top-5 for the 2010 Indy 500 is a great job by the #19 Dale Coyne Racing car of Alex Lloyd and Dario Franchitti's teammate Scott Dixon who took the #9 car to 5th. Please return to XSL Speed Reporter soon on more post-Indy 500 perspective.